This yoga posture is usually performed at the end of practice. But can be integrated into sequences with many benefits. Lie down on the mat with the hands down and a little out from the hips. Have the palms facing up. Stretch through the arms and fingers. Stretch also through the heels, toes or ballpoints of the toes. This yoga pose stretches the muscles in the legs, back, shoulders and arms. It brings balance to all the muscles in these areas and when performed throughout a sequence this posture provides great stabilizing results. This pose is part of a Yoga for Back Pain sequence. Tuck the tailbone forward and draw the navel up and back. 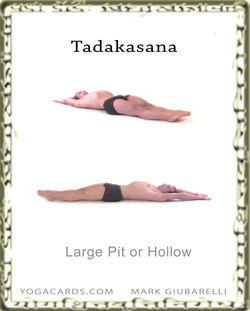 This will bring the lower back closer to the mat and create the hollow effect around the abdomen. Use this pose throughout your sequences. It goes well with backbends, lying spinal twists and many other postures.